The U.S. Girls’ Junior is going to the Eisenhower Golf Course at the United States Air Force Academy in Colorado Springs, Colo., in 2020. It will mark the first time a military organization’s golf course has hosted a USGA championship. The Junior Golf Alliance of Colorado, whose founding partners are the Colorado Section of The PGA of America and the Colorado Golf Association, will be the host group for the championship. It will be played June 13-18, 2020. The championship will be conducted on the Blue Course of the 36-hole facility, which was designed by Robert Trent Jones Sr. and opened in 1959. It can be stretched to almost 7,500 yards and is best known for challenging greens and scenic views of the Rocky Mountains. The last time the U.S. Girls’ Junior was held in the state was in 1982 at Greeley Country Club, when Heather Farr defeated Caroline Keggi, 2 and 1, in the championship’s final match. The U.S. Girls’ Junior was also held at Lakewood C.C. in Denver in 1957, as well as at Hiwan Golf Club in Evergreen in 1965. 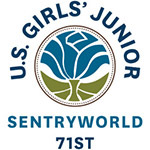 The 2019 U.S. Girl’s Junior will be played at SentryWorld in Stevens Point, Wis., from July 22-27. The Girls Junior Amateur is one of 13 national championships conducted by the USGA. The event is open to female golfers who have not reached their 18th birthday prior to the close of competition and whose USGA Handicap Index does not exceed 18.4. 36 hole stroke play qualifying from which 64 players advance to match play. Regional qualifying held at sites around the United States.